On Tuesday, Cemtrex fell 13% on huge volume. On the preceding trading day, Cemtrex’s banker Source Capital quietly had its SEC and FINRA registrations terminated following multiple violations. Over $1 million has been paid to notorious stock promoters sending CETX soaring from below $2. Heavy undisclosed selling by CETX insiders during paid promotion. DOCUMENTS: Founder Aron Govil is secretly paying promoters via an undisclosed entity with little or no other activity. Using same promoters behind imploded frauds Forcefield Energy and Code Rebel. PHOTOS: CETX’s supposed audit firm traced to vacant strip mall in Texas, no operations. Controlling partner was banned by SEC for multiple fraudulent audits, under multiple firm names. Nearly $100 million in revenues, from 4 countries on 3 continents. Cemtrex pays auditor just $20,000 per year in audit fees to sign off on financials. Non-sense. Note: This article represents the opinion of the author. Nothing herein comprises a recommendation to buy or sell any security. Following exposure of the problems listed below, I expect that many of the links cited may be changed or removed by the parties implicated. I have made various efforts to retain pdf copes and screen shots where possible. The author is short shares of CETX. Note: The short interest in Cemtrex (NASDAQ:CETX) is extremely low at just 400,000 shares (just a single day’s trading volume) such that this has created a very interesting situation. Yesterday we saw shares of Cemtrex fall by 13% on nearly 1 million shares of volume with no apparent news. But in fact, on the previous trading day (Monday was a holiday), Cemtrex’s investment bank, Source Capital, had its SEC and FINRA registrations terminated nationally and in all states. There was no announcement and no press release that I could find. The only way to find out was by checking FINRA’s Broker Check website. FINRA has still not uploaded the details of the latest violations, but we can see from a Florida lawsuit that Source was forced to pay a massive settlement to retirees who were sold risky and unsuitable investments that quickly went bankrupt. To me, this looks like the end of Source Capital. And it followed past violations by Source brokers including forgery, selling unregistered securities, withholding material information from investors and dealing at unfair prices. As my regular readers know, I often express significant concerns about problems I find with publicly traded companies. But these readers know that I will seldom come out and actually use the word “fraud”. But I feel comfortable that the extensive use of the word “fraud” is entirely appropriate in this article for the reasons below. The points I will make below are supported by on the ground photographs as well as official government documents from various agencies. 1. 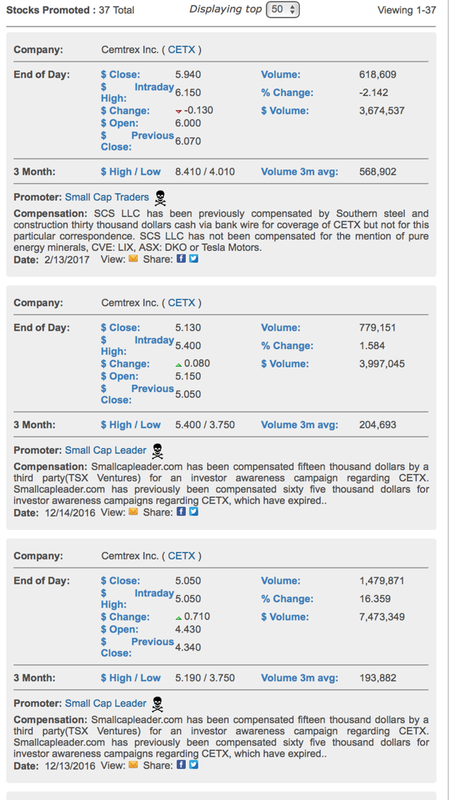 Cemtrex is being heavily promoted by a promotion firm known as “Small Cap Specialists” (AKA “SCS”). Past SCS promotions have been repeatedly halted or delisted due to financial irregularities or outright fraud. (Examples include delisted frauds Forcefield Energy and Code Rebel, among others). On its website, the SEC has gone so far as to specifically warn investors about these exact type of promoters as an indication of micro cap fraud. 2. Documents indicate that Aron Govil is paying this same promoter SCS to promote Cemtrex via wire transfers from an undisclosed entity in New York. The paid promotion by Cemtrex insiders has not been disclosed to Cemtrex investors. In the past, I have seen numerous examples of other companies engaged in similar undisclosed paid promotions that resulted in Federal charges or lawsuits for securities fraud. 3. As the share price has soared due to promotion, documents show that shares held by Cemtrex insiders (Aaron Govil, Saagar Govil and CFO Dela Rama) have been decreasing substantially during 2016, yet Cemtrex insiders have failed to disclose any sales on Form 4’s during 2016. On places like Twitter, the Govils continue to tout the stock, encouraging retail investors to buy. 4. The controlling partner behind Cemtrex’s auditor was banned by the SEC and PCAOB for conducting fraudulent audits or reviews of public companies while performing little or no work and without even being licensed. Cemtrex’s auditor continues to claim that the firm is run from an office in Texas. But photos show that this address traces to a long-since vacant strip mall. The audit firm is not even licensed to practice in Texas. The only listed phone number in the US has been disconnected. That partner has repeatedly audited public companies under the guise of differently named audit firms which have then been shut down. When one audit firm gets shut down, he has repeatedly created new ones and then audits the same clients, using the same personnel, reporting the exact same address in Texas. Cemtrex’s prior auditor was shut down by the PCAOB and is now classified as a “prohibited service provider“. Despite having revenues of nearly $100 million and operations in 4 countries across 3 continents, Cemtrex has only paid these auditors a mere $15,000-$20,000 per year to “audit” its complex financials. 5. The investment banks and IR firms hired by Cemtrex (including Source Capital) have repeatedly represented other heavily promoted companies that have been promoted by SCS or other promoters. There has been long running and significant involvement with companies, individuals or activities implicated in securities fraud. Over the past few years, I have exposed dozens of stock promotions, pump and dumps and outright frauds. The result tends to be the same in each case. After these stocks are exposed, their share prices fall by at least 80% to just pennies. In some cases, after I have exposed these companies, we have seen SEC investigations, criminal indictments, management and auditor resignations and other fallouts. In some cases, this has happened within just days of my article being published. In other cases, the stocks have simply imploded without further fanfare. With Cemtrex, there is a reason why the numbers appear to be “too good to be true”. There is a reason why there has been a surge of glowing media articles touting Cemtrex and its management. And there is a reason why the stock keeps selling off even when supposedly good news is released. There are clear reasons why hundreds of small retail investors have been duped into buying the stock and these are all thoroughly debunked and exposed below. Electronics Manufacturing Services (“EMS”) provides electronic manufacturing services, including product design and sustaining engineering services, printed circuit board assembly and production, etc. Industrial Products and Services (“IP”) offers services for in plant equipment erection, relocation, and maintenance; air filtration and environmental control products; and monitoring instruments, for measurement of emissions of Greenhouse gases, hazardous gases, etc. Cemtrex was founded 15 years ago by Aron Govil. Govil also runs Ducon Technologies which operates out of the same address as Cemtrex and which owns Cemtrex shares. Through his personal and Ducon holdings, Aron Govil is the largest shareholder in Cemtrex. In 2008, Govil appointed his 23 year old son, Saagar Govil, into various executive and board positions at Cemtrex. Young Saagar had just graduated from undergrad that same year in 2008, with no prior reported work experience. Just 2 years later, at the age of 25, Saagar was appointed CEO of Cemtrex and father Aron took the role of executive director and board member. Following the appointment of Saagar Govil as CEO, Cemtrex quickly embarked upon a slew of acquisitions, primarily of obscure companies in foreign countries well outside of the US. Cemtrex has employed an aggressive IR and media relations firm to obtain an avalanche of positive media coverage around the Govils and Cemtrex. Saagar has recently been the subject of a flood of glowing media attention due to his young age and the apparent rapid growth of Cemtrex’s revenues. Between 2012 and 2016, reported revenues grew from $12 million to $94 million, largely driven by acquisitions of insolvent companies in overseas markets, which then contributed heavily to Cemtrex’s results as soon as they were acquired. Again, based on my past experiences and observations, I believe that there is a very strong chance that Cemtrex gets delisted outright and will go to zero. In 2016, the SEC put out an Investor Alert Bulletin entitled: Fraudulent Stock Promotions. · The SEC suspended public trading of the security or other securities promoted by the same promoter. This is precisely what we see with Cemtrex and the promotions being run by a firm known as Small Cap Specialists (AKA “SCS”). SCS has been behind dozens of imploded stock promotions including a number of high profile frauds which were halted and / or delisted by the SEC. SCS happens to be the exact same promotion firm that Aron Govil is paying under an undisclosed entity name to run a pump campaign on Cemtrex. SCS has now been promoting Cemtrex for over 1 year. During that time, the share price quadrupled. First I will show how SCS repeatedly runs paid promotions on fraudulent companies which are then halted and/or delisted. Second I will show the documents which show that Aron Govil is paying SCS to promote Cemtrex, using an undisclosed entity name. And in the next section I will then show how Cemtrex insiders are secretly selling shares during the paid promotion campaign, without disclosing the sales to investors. Evidence of various paid promotions on Cemtrex along with the payments involved can be found at promotion tracking sites such as Hotstocked.comand Stock promoters.com. But these sites typically only capture a fraction of the promotions under way. As we can see from these sites, a well oiled stock promotion machine began aggressively pumping Cemtrex through a wide variety of online channels. So far, over $1 million has been paid to stock promoters. I include a partial screen shot showing various paid promotions on Cemtrex at the bottom of this section, or just click the links above. Here are just a few of the examples. There are dozens and dozens more, each of which tend to cost from $10,000 to $50,000 a pop. I will demonstrate below that Aron Govil is behind Southern Steel & Construction which is paying SCS. SCS has been responsible for numerous paid promotions on Cemtrex. This aggressive paid promotion is what took the stock from below $1.70 to over $7.00 in 2016. Here is just one example of an SCS promotion of Cemtrex which was paid for by an entity called “Southern Steel and Construction”. This promotion was dated October 2016, but it notes that SCS had been covering Cemtrex for a full year prior. We can see below that just two or three days coverage cost “Southern Steel” $30,000, which was paid via bank wire. Good morning everyone, This week’s featured profile is one of our favorite small cap’s since our initial coverage in October 2015. 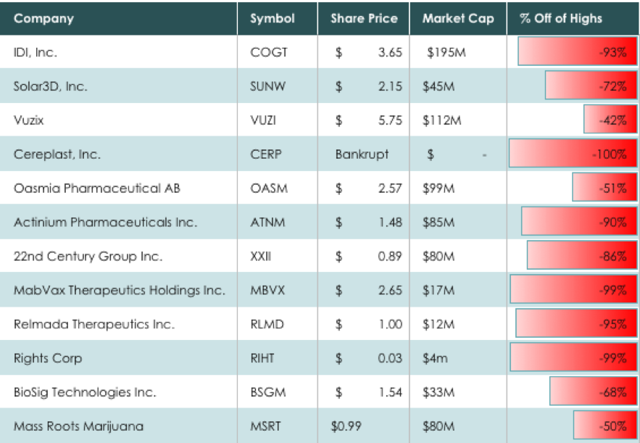 Cemtrex, Inc. (NASDAQ: CETX) CETX has been an amazing growth story through organic and acquisitions since our initial coverage last year. We are excited about what may be in store for this company going forward. So just who is Southern Steel ? The only individual identified on a search from the New York Department of State is Aron Govil at 19 Engineers Lane (which is Cemtrex’s address). First off….so New York’s corporate records for Southern Steel, which is paying for Cemtrex promotions by SCS, lists only Aron Govil at the same address as Cemtrex. And then second….Southern Steel’s entity status is listed as “inactive,” meaning that since August 2016 it has engaged in little or no other business activity other than paying SCS to promote Cemtrex. In fact, this information is a bit difficult to find. By default, the NY State database only shows “active” corporations. So when searching for this, one must opt to explicitly search for “all” corporations, both Active and Inactive. Again, this is just a single example of a paid SCS promotion. When a corporate insider makes sales of their own stock, this is very material information to outside shareholders because presumably insiders know much more than the rest of us. When an insider (management figure, director, or 10% holder) makes an initial purchase, that insider is REQUIRED to report the transaction on SEC Form 3. Subsequent transactions by such insiders (either buys or sells) are then REQUIRED to be reported on SEC Form 4. Retail investors in Cemtrex have tried to remain confident under the assumption that management is holding strong and not dumping shares. Precisely during the time of the paid promotion campaign, and along with the soaring share price, the number of shares held by Aron Govil, Saagar Govil and CFO Renato Dela Rama have all decreased significantly. The total decrease in their shares amounts to nearly 1 million shares, amounting to as much as $7 million in proceeds in 2016. 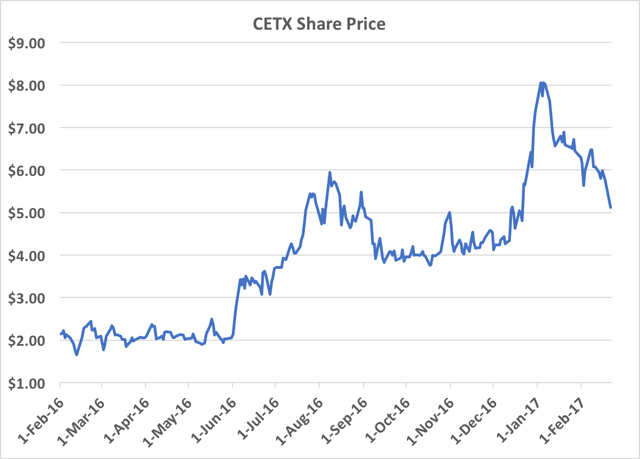 You can do the math yourself: During 2016, Cemtrex’s share price ranged from $1.65 to $7.38. Yet no form 4’s have been filed to disclose any share sales from any Cemtrex insiders whatsoever. Here is a link to all of Cemtrex’s SEC filings. It truly defies all common sense that ALL members of managementhad their shareholdings decline substantially while precisely NONE of them has filed a single Form 4 to disclose it. For those who wish to double check for themselves, here are the reference SEC filings. The table below shows the number of shares held as of each of those dates. We can see that for each of Ducon, Aron Govil, Saagar Govil and Renato Dela Rama, the number of shares has declined substantially.For the directors, we do not know, because they never filed the required Form 3’s to disclose their ownership. In November of 2015 (exactly when the paid promotion from SCS began), Ducon Technologies disclosed a purchase of 65,732 shares at a price of $2.55 for a total amount of $167,617. As disclosed, this took Ducon’s holding of Cemtrex common stock to a total of 433,219 shares. Ducon Technologies is controlled by Aron Govil, who is behind the entity paying for the undisclosed stock promotion. But according to the most recent Proxy filed in January of 2017, Aron Govil’s Ducon Technology now only has 102,951 shares. It therefore got rid of 330,268 shares during 2016. Because there were no Form 4’s filed, we don’t know the dates or the amounts of any sales. But we can see that the share price ranged from below $2 to above $7 in 2016. Therefore, depending on when its shares were sold, Ducon Technology could have sold up to $2.3 million. By comparing the Proxy’s issued in 2016 and then 2017, we can also see that shares held under Aron Govil’s own name declined by 222,049 shares in 2016. Again, depending on when these were sold, they could have been worth up to $1.8 million. As we will see, Saagar Govil’s share holdings increased by 100,000 during 2016. But during the year he also awarded himself 400,000 new shares via option grants, such that his position should have increased by 400,000. So clearly his net position actually declined by 300,000 shares. For Saagar Govil, the 300,000 decline amounts to up to $2.1 million in 2016 assuming the sale of stock at share prices up to $7.00. 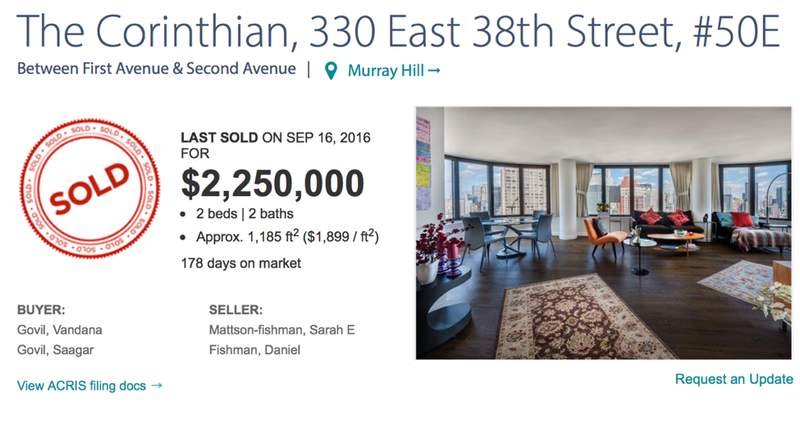 In September 2016 (with the stock having just hit new highs for the year), Saagar Govil also purchased an upscale condo in New York valued at precisely $2.25 million. (The timing, the prices and the disclosure omissions around Saagar’s 400,000 option grants also leads me to the question of if these were backdated to occur at artificially low prices. I will show the detailed documentation of in a section below). Moving on, we can also see that the number of shares held by the CFO also declined by 19,833, again with no Form 4’s being filed. Depending on when the sale was made, this would have a value of up to $138,831 (or more than triple his reported salary). With directors Sunny Patel and Shamik Shah, we can see that both directors report owning a few thousand shares worth up to $30,000-$40,000. But no initial Form 3’s were ever filed to disclose when they received these shares or at what price. We also don’t know how many shares they initially received in total, such that there may have been substantial selling here as well. Typically, new directors are awarded shares as of the date they join the board. For both of these directors, that would have been the Spring of 2015. New shareholdings by directors are ALWAYS required to be filed to the SEC, but NONE were ever filed by these directors. In my past articles I have exposed clearly how paid stock promoters will also infiltrate online message boards, social media (Twitter) and online financial blogs. They then pose as independent individuals who rally the enthusiasm behind their promoted stocks. Once you know what to look for, these paid promoters often become obvious online. They suddenly appear out of nowhere and begin aggressively cheering on a certain stock. At some point (when the promotion is ending) they disappear just as quickly and this is when we see the stock start falling apart. In addition, all throughout the paid promotion campaign, both Aron Govil and Saagar Govil have been actively cheerleading Cemtrex’s stock price on places like Twitter, encouraging retail investors to BUY BUY BUY. Obviously, this is highly unusual for any executive of any publicly traded company. They are supposed to be running a company, not sitting in front of their computers, Tweeting to promote the stock price. It also raises the potential for Reg FD violations. This is why we almost never see CEOs publicly touting their own stock on Twitter. Up through 2014, Cemtrex was using a defunct auditor called Li & Co. But Li & Co. was shut down by the PCAOB. During the investigation, Li & Co. simply refused to provide subpoenaed information to the investigators. That defunct audit firm is now listed as a “Prohibited Service Provider” and is no longer allowed to provide audit services. Following that, Cemtrex began using Bharat Parikh & Assoc as an auditor. Bharat Parikh is a small audit firm based in India, not the US, but with a supposed office in the US for auditing US clients. 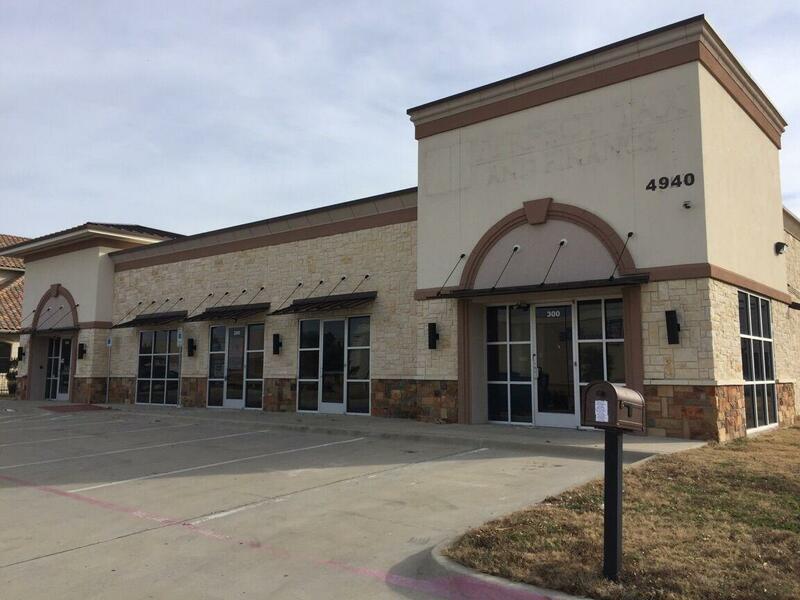 Even in recent weeks on Cemtrex’s just issued 10K filing, it continues to list Bharat Parikh’s office address in the US as 4940 McDermott Rd., Plano, TX. Here is a screenshot of Bharat Parikh’s signature from Cemtrex’s form 10K filed with the SEC just a few weeks ago, dated December 28, 2016. In fact, this corresponds to a vacant strip mall office in Dallas. Here are some photos of that vacant office space at 4940 McDermott Road. The photos were taken just a few days after that SEC filing came out. Clearly even though these offices appear to have been vacant for quite some time, Bharat Parikh continues to claim to the SEC that he is running a team that is performing audits out of this office. In addition, the US phone number listed on the auditor’s website has been disconnected. First, (obviously) the fact that Cemtrex’s auditor claims to be running a busy audit firm out of a long-since vacant building in a strip mall is troubling. Likewise, the disconnected phone number is equally troubling. 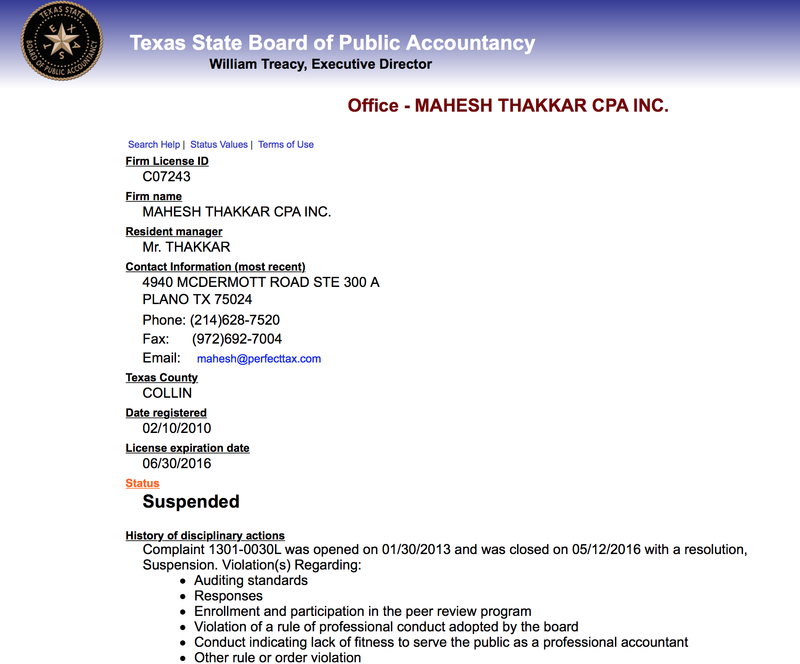 Second, Texas State Board of Public Accountancy has no record of Bharat Parikh even having a license to provide audits for public companies. Click the link above to search the database. Enter in any combination of Bharat+Parikh and / or BPA, etc. There is nothing. Third, Bharat Parikh & Associates is actually controlled not by Mr. Parikh, but by Mahesh Thakkar who holds a 51% stake in the auditor. Thakkar was banned by the SEC and the PCAOB due to accepting fees to provide fraudulent audits, and also for operating without a license to even provide audits at all. At the time, he was running an audit firm under a different name (Thakkar CPA / The Hall Group). But it was actually operated out of the same address (4940 McDermott), with the same group of personnel auditing the same clients. It is no coincidence that past clients from that partner then ended up simply switching over to the “new” firm using the “new” name Bharat Parikh (i.e. Cemtrex’s auditor) out of the same exact address. Thakkar has operated audit firms using multiple names, changing the name of the firm each time he gets shut down. Various names used by Thakkar include: The Hall Group, Thakkar CPA, and Bharat Parikh and several others. Most recently he has attempted to use the name TMK LA (in which Mr. Bharat Parikh is listed as his partner). Fourth, as we will see, Cemtrex pays this absentee auditor a mere $15,000-$20,000 in audit fees per year, despite claiming revenues of nearly $100 million from operations which span 4 countries and 3 continents. As highlighted by CFO.com, smaller firms tend to pay roughly $5,000 in audit fees per million dollars of revenue. That should place Cemtrex at nearly $500,000 in expected audit fees (even without sprawling international operations). Here is how we know all of this. 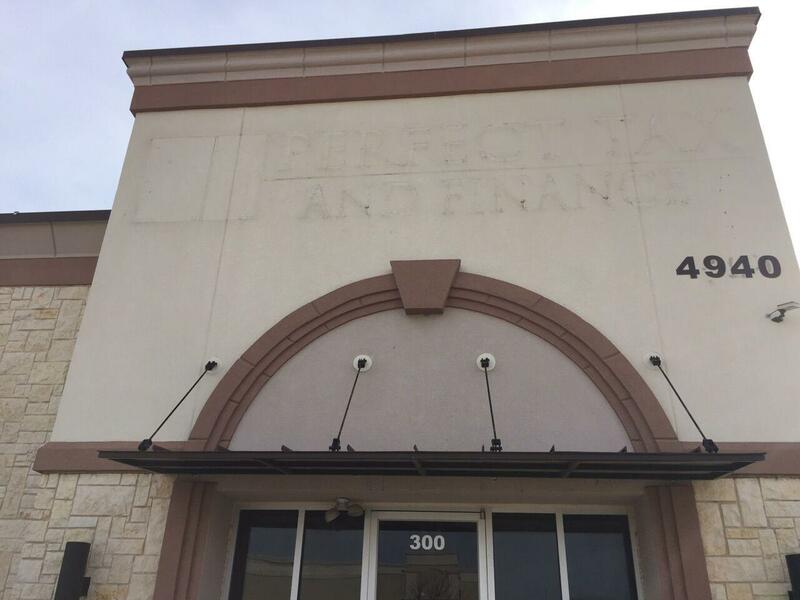 If you look closely at the picture of 4940 McDermott, you can make out the glue outline of the words “Perfect Tax and Finance“. Perfect Tax was founded and operated by Mahesh Thakkar, CPA and lists 4940 McDermott as its address. 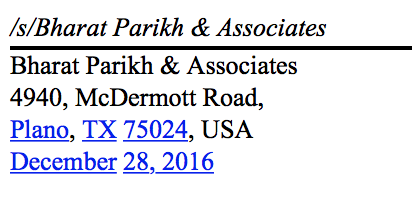 Thakkar partnered with Bharat Parikh out of this same address, which is again the same address that continues to be listed for Bharat Parikh in Cemtrex’s SEC financials even now. 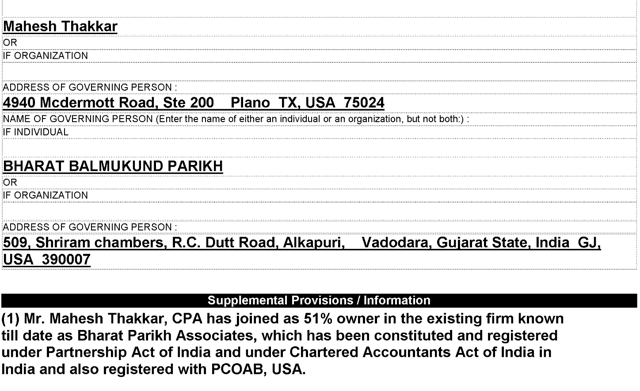 Here we can see that Bharat Parikh and Thakkar listed as General Partners in an LP called “TMK LP” that claims to provide CPA services, again from 4940 McDermott Road. 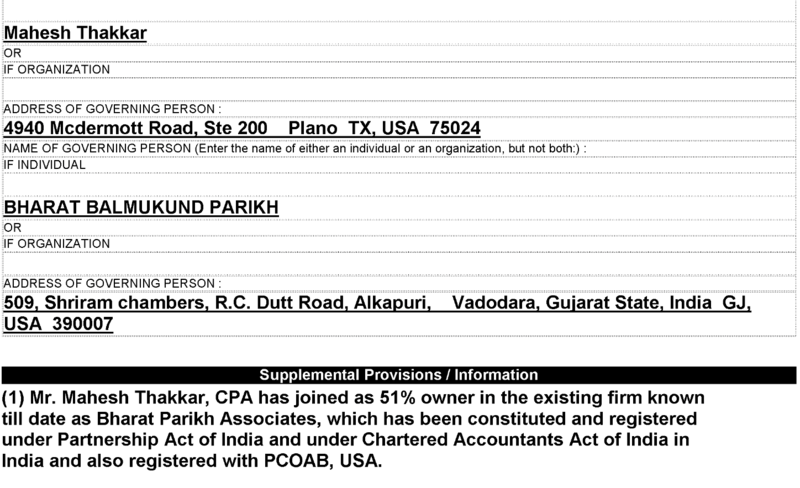 We can also see below from the Texas Secretary of State that Thakkar was listed as the CONTROLLING PARTNER in Bharat Parikh Associates, with a 51% stake and he uses the same address as Bharat Parikh, both in India and the US. Once again, this is 4940 McDermott Rd. HERE we can see where Bharat Parikh controlling partner /predecessor Thakkar was then barred by the SEC from practicing accounting for public companies. HERE we can see where its registration was revoked by the PCAOB. We can see then that prior to taking control of Bharat Parikh, Thakkar had previously run his audit shop under a different name in Texas, again covering public companies. This firm was Thakkar CPA d/b/a “The Hall Group CPA’s”. As with all of the other firms listed here, of course Thakkar CPA’s operated out of 4940 McDermott, the same vacant strip mall. (In the link above, simply type in the firm name of “Thakkar”). In its previous incarnation, Thakkar had formed Thakkar CPA’s to perform public company audits. But he had two problems. First, he had no PCAOB license to perform audits and second he had no clients. As a result, he simply bought an existing audit firm called “The Hall Group CPA’s” which had a number of existing public company clients. Thakkar then began signing off on audits for these clients. But according to the SEC, he never became registered with the PCAOB, which is required for auditing public companies. And here we can see where audit clients such as Pink Sheets traded Inolife simply switched over from the audit firm calling itself “Thakkar/Hall Group” to the one calling itself “Bharat Parikh” to complete their audits by a supposedly “new firm”operating out of the exact same address by the same group of people. According to the SEC complaint, there were actually a host of deep and concerning violations by Thakkar/Hall. You can click below to read them all, but we will focus on just a few of them below. These proceedings arise out of Thakkar CPA, PLLC d/b/a The Hall Group CPAs (“Thakkar CPA” or “successor firm”) issuance of 15 public company audit reports while it was not registered with the Public Company Accounting Oversight Board (“PCAOB”). Thakkar CPA’s audit reports misrepresented that the firm was properly licensed and registered with the PCAOB and falsely stated that it conducted audits in accordance with PCAOB standards. The Hall Group, Hall, Helterbran, and Cisneros collectively failed to conduct at least 16 annual audits and 35 quarterly reviews in accordance with PCAOB standards in at least three ways: (1) they repeatedly failed to prepare adequate audit documentation in connection with audit and review engagements; (2) failed to conduct – or failed to obtain – an engagement quality review (“EQR”) of audit and review engagements by a qualified reviewer; and (3) on at least four engagements, The Hall Group and Hall performed audit services while the firm’s independence was impaired. As a result, The Hall Group falsely stated that it conducted its audits in accordance with PCAOB standards in at least 16 annual audit reports for eight issuers. Additionally, Hall, after becoming CFO of DynaResource, Inc., allowed Thakkar CPA to provide audit services to DynaResource, Inc. even though he knew he had a direct financial interest in and a business relationship with the company’s external audit firm. So Bharat Parikh’s controlling partner / predecessor was banned because on 35 separate occasions it did not prepare audit documentation, it did not have a partner even conducting audits and it falsely attested that it had properly conducted audits. Basically, Thakkar was getting paid small amounts of money to sign off on these audits without really doing any work at all ! In addition, the firm signed off on audits in a company with which it clearly had a direct financial interest and was therefore not independent. Here is why this matters. (And this should become quite obvious). Cemtrex purports to generate revenues of nearly $100 million coming from 4 international subsidiaries spanning 3 continents. Presumably this makes Cemtrex relatively complicated (and expensive) to audit. This audit then gets even more expensive when the company needs to integrate ongoing acquisitions of totally new businesses. Any realistic cost assessment of such audit work for any normal company could run as high as $500,000-$1 million. Easily. Yet in Cemtrex’s 10K we can see that paid it’s absentee Indian auditor a mere $20,000 to perform its audit work in each of the last two years! And in the previous year, audit fees amounted to just $15,000. Even for a small company with operations in just a single city, no auditor can justify even preliminary work for just $15,000-$20,000. For a company operating in 4 countries across 3 continents, this is just patently absurd. And it seems very consistent with the history of Thakkar / Hall etc. signing off on so-called “audits” without actually doing any real work. In my view, the $15,000-$20,000 looks like little more than a convenience payment for a rubber stamp signature. The situation on the inside of Cemtrex is no better. Cemtrex’s CFO is Renato Dela Rama. Presumably in this role, he would be responsible for coordinating the audit with Bharat Parikh, if one were actually being done. But in 2015, Cemtrex reported in SEC filings (see below) that Dela Rama received zero compensation for this role in 2014 as well as in 2015. 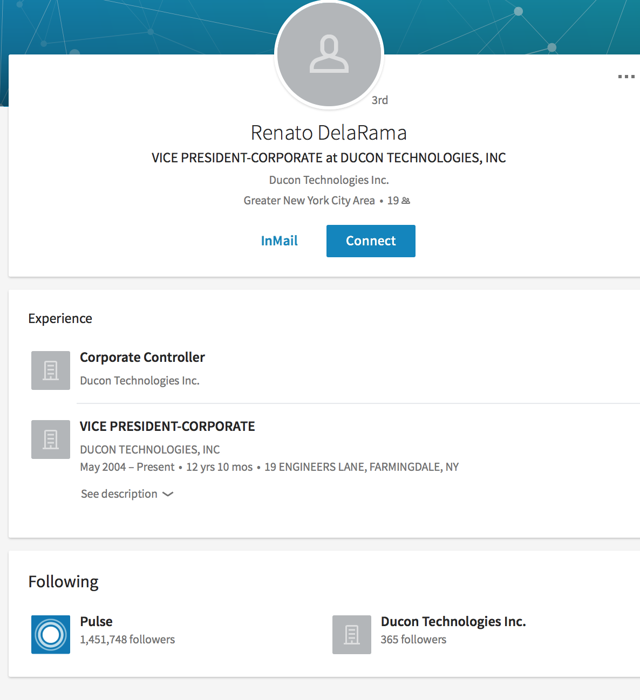 In fact, on his LinkedIn page Dela Rama does not even disclose that he even works for Cemtrex at all. Instead, he only lists that he is the controller for Ducon Technologies, which is run by Aron Govil. So, lets get this straight: Cemtrex’s CFO doesn’t even report that he is the CFO of Cemtrex and for the past several years, Cemtrex also discloses that he wasn’t even getting paid for that role. In fact, he is actually getting paid by Aron Govil via Ducon. And Aron Govil is the guy who is using an undisclosed entity to pay notorious stock promoters to finance a touting campaign on Cemtrex. In 2017, Cemtrex’s SEC disclosure suddenly contradicts its 2015 disclosure. The fact that a change was made is never noted and certainly not explained. Years after the fact, Cemtrex began claiming that it had actually paid Dela Rama $40,000 per year in each of those previous years. In fact, the $40,000 number becomes even more troubling. Even at $40,000 this is exceptionally low pay for a CFO of a supposed multinational conglomerate. It is also well below what he gets paid by Aron Govil at Ducon, where Dela Rama is not even CFO. No one would be expected to devote full time attention to a multinational company for just $40,000 per year, especially not in New York. My secretary in New York used to make over $60,000. For reference, here we can see that average salaries for any full time CFO in the US was $315,947 as of December 2014 (about 8x what Dela Rama is supposedly being paid, if he is being paid at all). And to be clear, over $1 million has been paid to notorious stock promoting firms to pump up the share price while only $15,000-$20,000 has been paid to supposedly “audit” the financials for the entire company. Meanwhile the CFO is only supposedly paid $40,000. For the reasons above, I have precisely zero confidence in the financials being reported by Cemtrex. This will become especially clear below when we look at the spectacular performance which Cemtrex has reported immediately after acquiring obscure foreign companies which are revealed to be entirely insolvent just before being acquired by Cemtrex. The Cemtrex financials signed off on by Bharat Parikh and CFO Dela Rama have now shown 20 straight quarters of apparent profitability and soaring revenues. This “success” has then been widely echoed and amplified by the aggressive stock promoters being paid by Aron Govil through an undisclosed entity. And this is exactly the formula which caused the stock to soar from below $2.00 to over $7.00 in 2016. Whenever I come across another paid stock promotion, I always, always, ALWAYS know exactly what I will find next. Each of these companies relies on the same 3rd party service providers such as law firms, investment banks and “IR firms“. The world of small cap stock promotion is basically a small country club and all of these guys know each other. With Cemtrex, we can see that the company has relied heavily upon Chardan Capital and Source Capital as its bankers. For IR, Cemtrex uses Irth Communications. Each of these firms will be detailed below. But it is safe to say that there is very notable overlap between the client lists of all three firms. They all work for many of the same firms and people. From there, we also see that they also service the exact same companies which have been heavily promoted by the exact same stock promoters, including SCS, listed above. In each case, these client companies have then repeatedly imploded or been halted or delisted, due to fraud. First, if the last 20 or so companies represented by these third parties generally skyrocketed due to excessive promotions and then imploded, it seems like a safe assumption for any objective investor to suspect that Cemtrex might do the same thing. This is just common sense. Second, when this pattern of shareholder destruction is so obvious with their client lists, why on Earth would any company ever select these 3rd parties to represent them (unless they simply had no alternatives, because they too were nothing more than a blatant stock promotion). Again, this is just common sense. Cemtrex relied upon Source Capital Group to run its recent rights offering which was completed a few weeks ago in January, raising $13 million. Goodman & Nekvasil, P.A. won a FINRA arbitration award against Source Capital Group on Feb. 3 while working on behalf of three retirees, William B. Lashlee and Keith and Joyce A. McCrea. Lashlee is an 88-year-old retired native of St. Simons Island, Georgia, and the McCreas are a retired couple who live in Yorkville, Georgia. Both groups alleged they were sold unregistered and unsuitable investments in IPG stock by Joseph Hooper, who was working as a representative. Lashlee invested $220,000 and the McCreas invested $590,000 for a combined total of $810,000 in IPG stock. IPG quickly went bankrupt and Source was found to have been negligent. 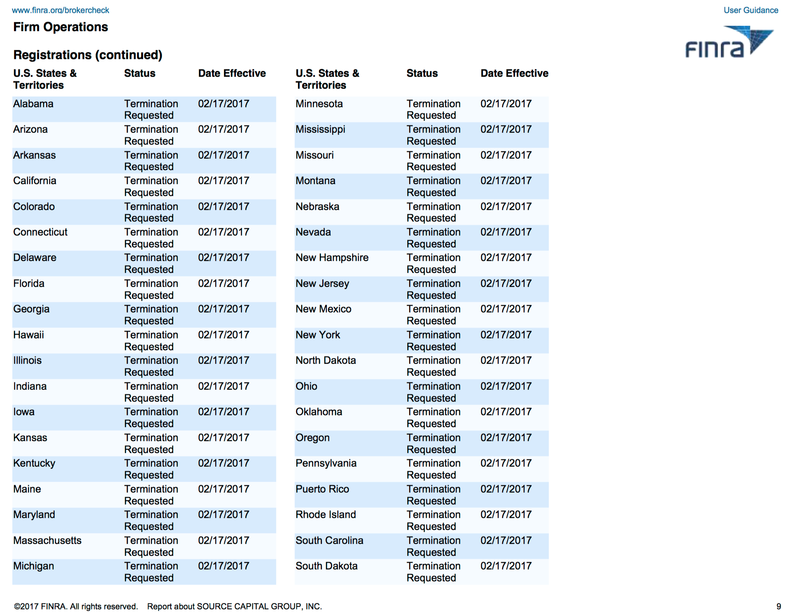 As of last week (February 17th, 2017), we can see that Source Group had its FINRA registrations terminated in all states in which it was operating. FINRA notes that Source Group ceased business operations in February 2017. From Source’s website we can see that the firm has raised money for a number of other heavily promoted microcaps which then imploded. Like Chardan below, this includes a number of tiny Chinese reverse mergers which were delisted (but only after they raised substantial capital from US investors). My regular readers will remember back when I previously exposed a massive stock promotion ring run by “The Dream Team Group“, which also operated under the name of Mission IR. Dream Team / Mission IR had recruited numerous authors to write extensive undisclosed paid promotions on dozens of micro cap stocks. These authors would pretend that they were industry experts or hedge fund managers and would write aggressive articles recommending the client stocks. These stocks then soared in price, allowing the companies and their management to sell stock at inflated prices. After my expose, each of the implicated companies ended up plummeting by as much as 95%, and a number of civil suits and SEC investigations ensued. Dream Team / Mission IR were the architects behind a widespread ring of stock fraud and promotion. I even produced the internal documentation to prove it. Here we can see that Mission IR lists Source Capital as its “conference partner“. Here we can also see Mission IR promoting Source Capital’s “Disruptive Growth Conference“. Note that a number of the companies which attend Source’s investor conference also happen to be banked by Chardan and/or are clients of Irth Communications as well. These attendees of Source’s disruptive growth conference also happen to be heavily promoted by the same promoters listed above, including our favorite, SCS. This is easy to see by logging on to either Hotstocked.com or Stockpromoters.com. At FINRA’s Broker Check website, we can also see where Source was fined by FINRA for having sold investments to investors “without disclosing material facts” and sold investments by making “exaggerated promises in multiple emails” as well as selling securities “at prices which were not fair“. Either way, following the termination of its FINRA registration in all states, it appears that Source Capital is no more. Cemtrex retained banker Chardan Capital Markets to run its S3 offering in 2016. Cemtrex was then forced to withdraw the offering because Cemtrex did not meet the requirements as a result of failing to file required SEC documents . Chardan and its management have a long history of run-ins with the SEC and FINRA. This includes various reports of manipulating small cap stocks, insider trading activity, failure to disclose various stock holdings and transactions as well as defrauding the US Small Business association out of $35 million. Chardan then launched into the Chinese Reverse Merger / SPAC game. Geoinvesting subsequently highlighted no less than 17 different examples of Chardan Chinese reverse mergers/SPACs, the majority of which completely imploded following exposure of or allegations of fraud. 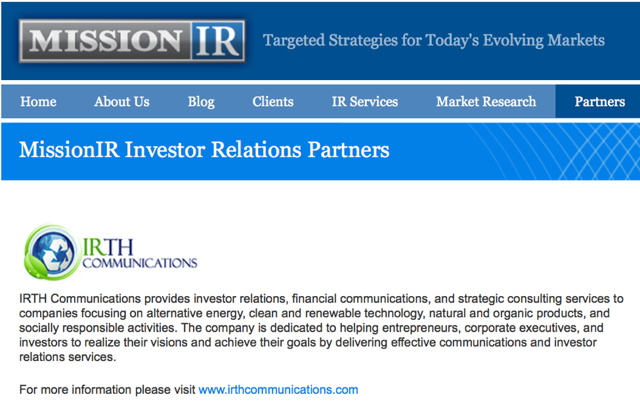 Cemtrex’s IR firm is Irth Communications. 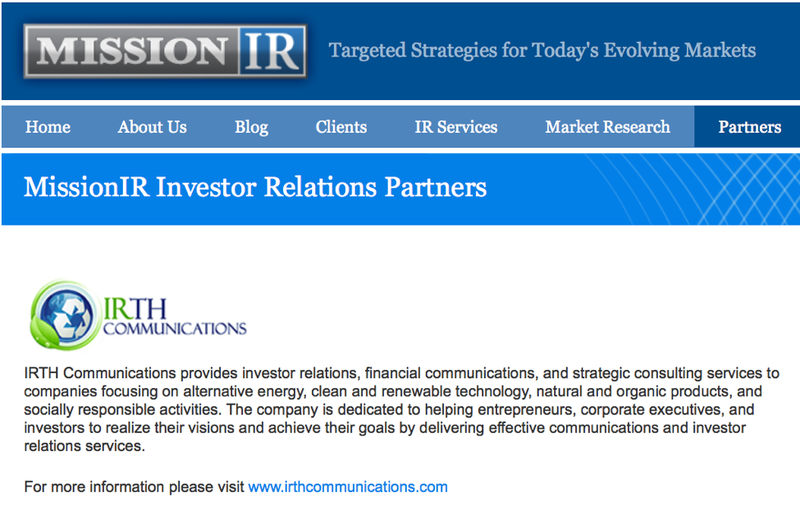 As with Source Group above, Irth is listed as an IR partner of Mission IR (AKA the Dream Team Group) which was found to be behind a massive illegal stock promotion ring. As shown on its website, Irth has been responsible for various aggressive media placement campaigns for its clients, getting the stocks and their management strong favorable mentions in mainstream media outlets. But as we can see below, many of these stocks are the same stocks that have been heavily promoted by the promoters listed above, including our favorite, SCS. These stocks have then eventually imploded despite tremendous positive coverage generated by Irth. Many retail investors have been lured into buying Cemtrex stock solely as the result of seeing these high profile, positive media placements on Cemtrex which have been entirely arranged on their behalf. As for the glowing media coverage that has suddenly exploded upon Cemtrex and the Govils, this is something that I have seen on many occasions. Just 60 days later, CCME was delisted when it was uncovered as an abject fraud. Thanks Forbes. In the US, the micro cap Organovo shot up 3.5x from $4.00 to $14.00 following the publication of this article in Popular Science, which was a full feature on that microcap stock filled with hype and hyperbole. Organovo subsequently fell from $14.00 to its current levels of $2-3 when it became apparent that the “3D printing of body parts” was pure fantasy. Thanks Pop Sci. In these cases above, there is certainly no evidence that this coverage was paid for. However, it has been my observation that anyone can obtain glowing media coverage if enough money is paid to a PR/IR/Media agency. Given that millions of dollars have already been paid to stock promoters, it should come as no surprise that aggressive media placements have proliferated covering Cemtrex and the Govils. Irth was founded by brothers Andrew and Robert Haag. The Haag Brothers had both previously worked for small cap investment bank Auerbach, Pollak & Richardson. Auerbach folded in 2001 after its securities registration was revoked following a variety of regulatory violations. In 2002, Andrew Haag then went to work as CFO and director of microcap reverse merger Quintek Technologies, a former Auerbach client. In 2002, Quintek’s CEO was sanctioned by the SEC for having put out a variety of false and misleading press releases regarding phony purchasing orders, causing the stock to soar dramatically, coincidently just as the company was looking to raise money. Haag stayed on with Quintek until 2008. He notes that as CFO, he “Raised $5 + million in capital, Increased Valuation + Liquidity, Expanded Shareholder Base 10 fold, Responsible for Cash Management, Responsible for Public Filings, Corporate Development”. But we can see that by 2008, the SEC was already hounding Quintek for putting out delayed financials which contained material inaccuracies (ie. Just like Cemtrex). These financials then needed to be publicly restated. As CFO, Hagg stated to the SEC that he would be retaining a PCAOB audit firm to rectify the inaccuracies in the financials. But instead, the members of management simply resigned and Quintek stopped making further SEC filings. Quintek just went dark leaving investors with nothing. Following the implosion of Quintek, Haag and his brother then founded Hampton Growth Capital which focused on “Investor Relations” and “Capital Formation“. Like Chardan and Source above, Hampton placed a heavy focus on servicing Chinese reverse mergers, helping to promote them so that they could raise money from US investors. By 2011, following the wave of fraud among Chinese reverse mergers, Hampton’s Chinese reverse merger clients had been completely delisted. With Hampton in disgrace, the Haag brothers then ceased using that name began using a new name, “Irth Communications”, and promoting US based micro caps. Below you can see the stock performances of some clients of Irth Communications. You can see that most of these have imploded by as much as 90% from their highs following the promotion. For those who wish to check on their own, you can see that most of these Irth clients happen to also have been the subject of heavy paid promotion including via our favorite promoter group SCS. Checking this is easy by simply going back to Hotstocked.com or Stockpromoters.com. Given the state of Cemtrex’s auditors and bankers, seeing blatant errors, “irregularities” and inconsistencies should come as no surprise. But as I have shown repeatedly in past articles, when we see such repeated irregularities in a company’s SEC financials it generally presages an implosion in the share price and/or a delisting of the stock. Again, here is a link to all of Cemtrex’s SEC filings. Anyone who has performed a detailed review of Cemtrex’s SEC filings should know that Cemtrex tends to play very fast and loose with its SEC reporting requirements. The filings that Cemtrex is required to make have been late, they have been inaccurate, there have been blatant inconsistencies between various filings that are never reconciled. This includes even the most major filings such as the annual 10K and the Proxy. Cemtrex originally filed its previous 10K filing in December of 2015. Almost 9 months later, it was still filing amendments and corrections to correct blatant errors in that filing. The mistakes included very major items, such as the details of its liquidity position, as well as many minor items such as various spelling and grammatical mistakes which should never be found in a 10K. The delayed and inaccurate filings are the reason why Cemtrex was forced to cancel its S3 equity offering in 2016, which was being run by Chardan Capital. Instead, Cemtrex was then forced to conduct a much more lenient rights offering, which would then be run by Source Capital Group. Rights Offerings can be completed even by those companies who become ineligible to do an S3 offering. We did not timely file with the SEC (NYSE:I) our definitive proxy statement, which includes the information required by Part III of Form 10-K, within 120 days of our fiscal year ended September 30, 2015, (ii) our Form 8-K in relation to our meeting of shareholders held on March 7, 2016, or (NASDAQ:III) several other current reports filed during the preceding 12 calendar months. All of these reports were ultimately filed, but their lateness caused us to become ineligible to use Form S-3, a shorter registration statement that is often used for “shelf” registrations. If we are not able to file our current and periodic reports and other documents with the SEC in the future in the times specified by the Securities Exchange Act, we will continue to lose our eligibility to use Form S-3 for future capital raises, and that could impair our ability to conduct more efficient and expeditious public offerings of our stock off of shelf registrations. Our inability to timely file current and periodic reports in the future could materially and adversely affect our financial condition and results of operations. As we saw above, Cemtrex originally disclosed that it pays its CFO nothing. Later on, it quietly revises this previous disclosure after the fact and without explanation. The new disclosure indicates that this CFO of a $100 million revenue multinational is paid a mere $40,000. And then next we saw how the number of shares of each and every member of management has declined substantially over the past year (during a paid stock promotion), even though none of them filed a Form 4 to disclose any sales. So now let’s explore the issue of possible backdating of option grants by Saagar Govil, just before the paid stock promotion campaign really took off. As we saw above, the bulk of the promoting campaign began in March of 2016. On February 12, 2016, the Company granted a stock option to purchase 200,000 shares of Common Stock to Saagar Govil, the Company’s Chairman, Chief Executive Officer, President and Secretary. These options have an exercise price of $1.70 per share and expire after six years. Because publicly traded corporations must properly report the value of options on their financial statements, any backdating could result in a misstatement that can be the basis for a charge of securities fraud. This becomes more of an issue when we look at the quarterly financials that Cemtrex filed with the SEC AFTER Feb 12, 2016. In that 10Q filed in May of 2016 (3 months AFTER the options had supposedly been awarded), Cemtrex disclosed no change in “Share Based Compensation” for the quarter despite the 200,000 options which had supposedly been granted to Govil in February. By the time that quarter was reported, the share price had already risen by around 30%. Upon receiving that options grant, Saagar would have been required to disclose it on Form 4. However, no Form 4’s were filed in all of 2016. The second grant to Govil is just as curious. In the most recent 10Q filed with the SEC in February 2017, Cemtrex disclosed that it had awarded another 200,000 shares of options to Saagar Govil. It had noted that the options were granted on December 5th 2016, at a price of $4.25 per share. Looking back from February 14th, 2017, we can see that again the week of December 5th again corresponded to the lowest closes for the stock over the preceding 3 months. Once again, Mr. Govil had impeccable timing. What gets really curious again is the fact that when Cemtrex released the 10K on December 28th (i.e. AFTER the supposed options grant had already been given) the company only disclosed the earlier 2016 option grant and not the new one, supposedly made on December 5th. Again in January 2017, Cemtrex released its Proxy Statement. And again, the company only disclosed the earlier February stock grant to Govil. No mention was made of the December 5th options grant. And just as in the past, Saagar Govil never filed the REQUIRED Form 4 to disclose the new shares given to him. In January, the stock really took off. 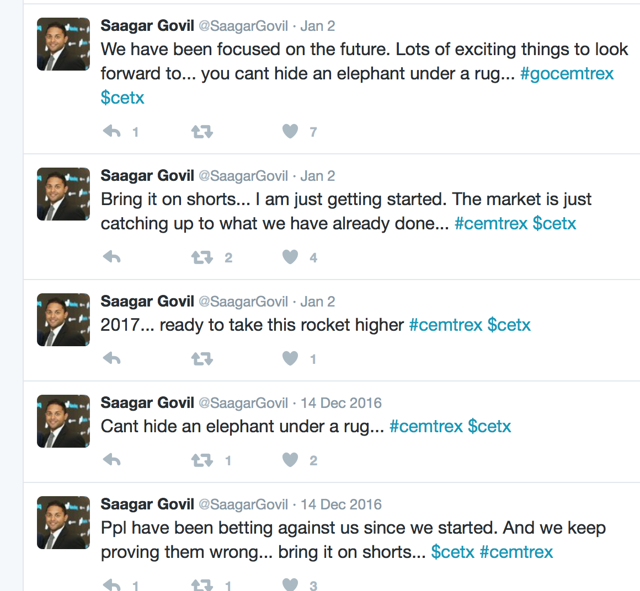 By the time Cemtrex disclosed the new options grant to Govil, the share price had repeatedly broke through new highs north of $7.00 and had briefly exceeded $8.00, such that backdating the options just before releasing the 10Q could have resulted in as much as $800,000 in instant profits for Saagar. These discrepancies are particularly notable given what we have seen with the auditor and the CFO. Separately, we can also see that Cemtrex’s outside board members consist of Shamik Shah and Sunny Patel. Both of these individuals are young hedge fund traders who focus on trading stocks, futures and/or derivatives. They show no experience in anything related to running a public company, engineering or environmental controls or accounting issues. They have no business being directors of Cemtrex, aside from potentially around issues regarding trading the stock. Just like Saagar Govil, we can see that 30 year old Shamik Shah went to school in New York and graduated with his undergrad degree at exactly the same time as Saagr Govil in 2008. Diretor Sunny Patel is also now 30 years old also graduated from the same school in New York in 2008 and also worked as a derivatives trader with a hedge fund. Just like Saagar Govil, these two were brought on as directors for Cemtrex despite having no relevant work experience. Both Shah and Patel were appointed as directors in April and May of 2015. That happened to be precisely when Cemtrex was applying to uplist from the OTC BB to the NASDAQ. As part of that process, the company is required to have outside board members, which is why Cemtrex appointed these two then 28 year olds with no relevant experience those roles. By fulfilling this simple requirement, Cemtrex was then able to uplist to the NASDAQ just a few weeks later. Either way, as directors of a public company, these individuals are presumably now fully on the hook for any potential issues which may arise from any potential undisclosed paid stock promotion, auditor misrepresentations and/or selection issues, financial statement irregularities, back dating of options and etc. HERE IS THE CONCLUSION !! I believe that it is highly likely that Cemtrex will face delisting and go to effectively zero. Cemtrex management is paying for an undisclosed stock promotion via an undisclosed entity called Southern Steel & Construction. 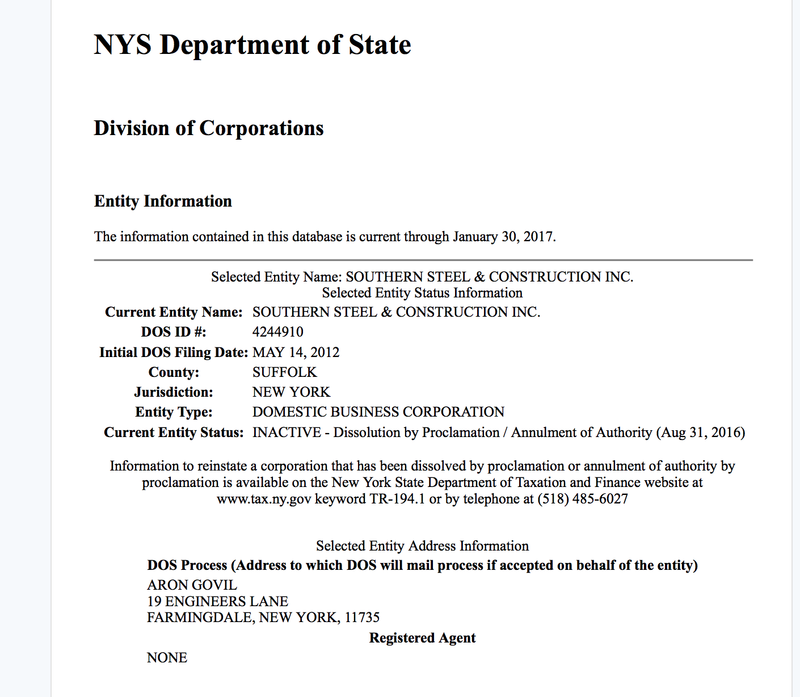 Aron Govil is behind Southern Steel & Construction, and that entity reports the same address as Cemtrex. The promoters being paid include SCS, whose past promotions have imploded, been halted or delisted, including due to fraud. During this undisclosed paid promotion, the Govil’s have actively encouraged investors to buy Cemtrex shares via social media. At the same time, members of management have been making large sales of stock without disclosing those sales on Form 4 as required by the SEC. Cemtrex’s auditor (Bharat Parikh & Assoc.) is actually controlled by an individual (Mahesh Thakkar) who has been banned by the SEC and PCAOB as a result of multiple past audits, sign off’s or reviews which were fraudulent. Cemtrex’s auditor continues to report to the SEC that it is running its operations out of 4940 McDermott Rd., Plano, TX. Yet that location is actually a completely vacant strip mall. The phone number has been disconnected. According to Texas State records, the auditor is not even licensed to practice in Texas. Thakkar has run multiple different audit operations out of 4940 McDermott under various different names (including Thakkar CPA, The Hall Group CPA, TMK LP and now Bharat Parikh). Each one of the previous ones has been shut down. Thakkar then changes the name of the firm and keeps auditing the same clients, all from the same vacant address. Cemtrex claims to generate nearly $100 million in revenues from subsidiaries across 4 countries and 3 continents. Such a company would normally expect $500,000-$1 million in audit fees per year. Yet Cemtrex pays Bharat Parikh a mere $15,000-$20,000 per year. Cemtrex’s 3rd party service providers include Source Capital, Chardan Capital and Irth Communications. Each of these parties has a long and noticeable history of doing business with small cap stock promotions which have been promoted by SCS or the other promoters behind Cemtrex. There have also been past involvements with companies, individuals or activities with have involved imploded stock promotions or securities fraud. Cemtrex’s filings repeatedly contain information which is either inaccurate or inconsistent between filings. Many filings comes extremely late. Many required filings have not come at all. It is clear that shares owned by members of management have declined substantially during the course of the paid promotion. Yet no Form 4’s have been filed to disclose sales to investors or the SEC. Past disclosure states that the CFO was working for years at zero salary from Cemtrex, while he was being paid by Aron Govil’s Ducon. Option grants to Saagar Govil occurred at times when the share price was hitting deep lows. These grants were not disclosed until after the share price had appreciated substantially. Earlier filings, which should have disclosed the impact of those new shares under the option grant, made no mention of the options until much later, after the share price had already risen. Again, to me the case for fraud and delisting seems obvious. Just like Cemtrex, each of these stocks surged by hundreds of percent following aggressive promotion campaigns by SCS promoters. Just like Cemtrex, each of these stock promotions had a very well crafted investment story specifically designed to lure in retail investors. Each of these stocks were then halted or delisted outright when the SEC found financial irregularities or outright fraud. So again, these are the exact promoters that Aron Govil is paying using an undisclosed entity in New York. Both Hotstocked.com and Stockpromoters.com continue to list the paid promotions of these stocks which were run by SCS. Just like Cemtrex, Code Rebel was being promoted by SCS as an acquisition play. Paid promotion and press releases around the acquisition hype caused the stock to surge by several hundred percent shortly before it was delisted and went to zero. because of questions regarding the accuracy of statements in CDRB’s Forms 10-Q for the quarters ended June 30, 2015 and September 30, 2015, and the Form 10-K for the year ending December31,2015, concerning the company’s assets and financial condition. This order was entered pursuant to Section 12(k) of the Securities Exchange Act of 1934 (Exchange Act). Similar promotion efforts by SCS caused Forcefield Energy to soar by hundreds of percent. In the case of Forcefield, the stock quickly fell by 60% immediately after my own article exposing the fraud. In fact, within just a few days of my article exposing the fraud, the stock was halted by the SEC and then delisted. It was a zero within just days. due to concerns about the adequacy and accuracy of information available to investors concerning the funding of recent articles and promotions touting FNRG, including for example in articles published on December 9, 2014 and February 26, 2015. Questions have also arisen concerning potential manipulative activity of FNRG’s stock, including transactions between February 25 and April 2, 2015 and the funding of those transactions. This order was entered pursuant to Section 12(k) of the Securities Exchange Act of 1934 (Exchange Act). For reference, here is my previous article on Forcefield, which I published when the stock was at $7.50 – just a few days before that suspension from the SEC. Here is a partial screenshot showing just a few of the recent promotions, click the links above to see dozens and dozens more. I encourage interested readers to go to Hotstocked.com or Stockpromoters.com to read more examples. Despite the warnings from the SEC, there seems to be a never-ending stream of new retail investors who continue to fall for the well-constructed schemes of stock promoters. And aside from those stocks that have been halted and delisted, these promoters have been behind dozens of additional stock schemes which simply imploded to the pennies without ever being formally halted or delisted. The Govil’s have repeatedly made it a point to blame “the shorts” for any weakness in the share price and for any criticism that comes to their company or management. This is a very common diversionary tactic with stock promotions. Unfortunately, many naïve retail investors continue to fall for it. But with Cemtrex, the math simply doesn’t add up. As of January 31st, there were only around 400,000 shares sold short, amounting to just over $2 million in total. This is virtually nothing. Cemtrex typically trades around 500,000 shares every day. The short interest has also been steady at 100,000-400,000 shares for the past 6 months, such that there has been very little increase relative to the volume. Every share sold short could easily be covered within 1-2 trading days while having minimal impact on the share price. Likewise, the entire short interest of 400,000 shares would have minimal effect of Cemtrex’s share price over this time. Here is the link to the NASDAQ showing short interest as well as a screen shot for your convenience. Note that the “days to cover” indicates that the entire short interest could be covered in a single day’s trading. SCS’s promotion of fraudulent Forcefiled Energy was just the same. Despite a very low short interest, Forcefield tried to distract retail investors by blaming its problems on evil short sellers. But this diversionary tactic from management didn’t slow the immediate 60% plunge in the share price of Forcefield. Clearly inside share holders were the ones selling big even as they were trying to persuade retail shareholders not to sell or to even buy more. But this would only be revealed once the subsequent criminal indictments came out against Forcefield Management. For your reference, here is a press release put out by Forcefield Energy just after my article in which the Chairman accuses “the shorts” of disseminating false and misleading information. He also claims that he was initiating a regulatory investigation with the SEC to supposedly pursue “the shorts” in defense of his shareholders. Instead, the Chairman was doing no such thing. Right as he was issuing press releases to reassure retail holders, he was actually in the process of attempting to flee the country while he was simultaneously dumping his shares. Within just days, he was arrested by the FBI as he attempted to board a flight to Central America. Forcefield’s stock was halted, going quickly to zero. The Justice Department later announced that 9 individuals were arrested and indicted on massive securities fraud charges behind the promotion of Forcefield. I have frequently come across many similar examples of stock promotions who try to distract retail investors by diverting attention to “the shorts”. They all typically tend to end the exact same way (with a trading halt, a delisting or a simply share price implosion).